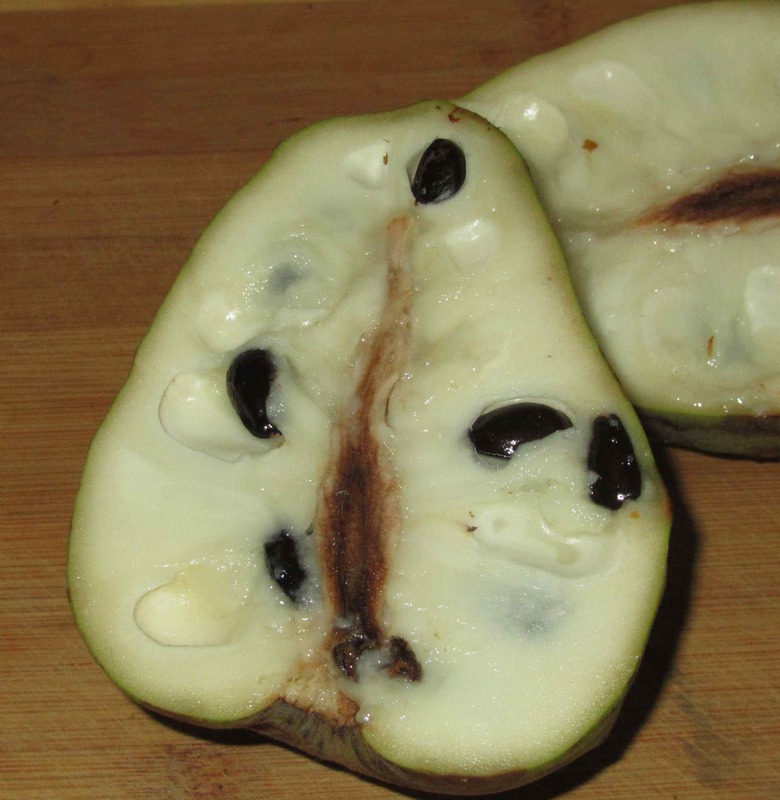 On being sliced, the Cherimoya reveals a pale white flesh inside the thin, green skin. Scattered throughout, almost randomly, are dark, irregular seeds that are roughly a half-centimeter or so in greatest dimension. The flesh, although it is difficult to tell in the photograph, is quite soft and somewhat buttery, with a texture very much like an avocado. There was a mildly sweet and fruity aroma but it really was too faint to suggest anything in particular. 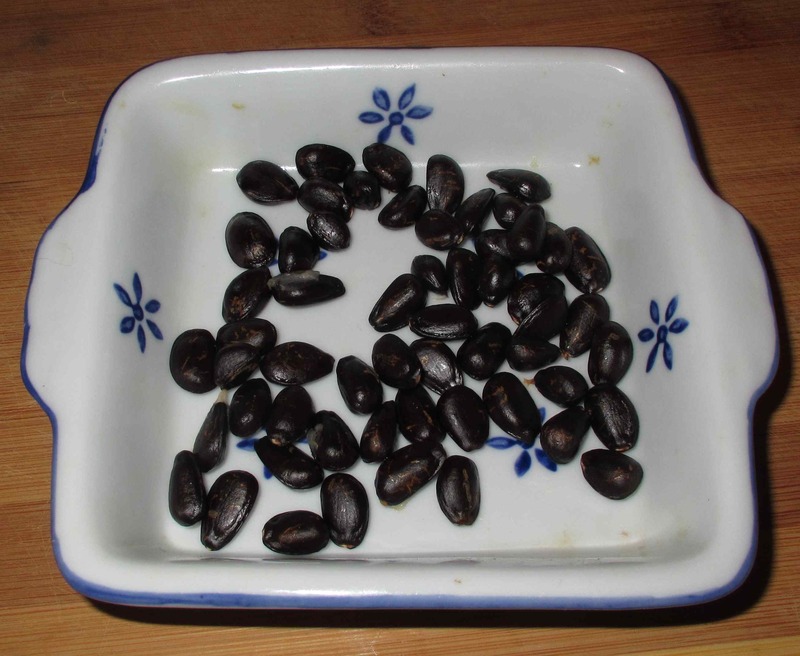 Here you can see the sheer number of seeds taken from a single fruit. They are, I discovered during my research, poisonous on the inside, and so it is important not to bite into them when consuming the fruit. One could, I suppose, remove them all before eating but there are so many of them that the remaining pulp would be completely fragmented (almost to the point of being mush). Accordingly, my wife and I each ate a half by scooping out the flesh with a spoon and then spitting the seeds out while eating each mouthful. The taste, we both agreed, is very pleasant. Wikipedia describes it as being a ‘blend of banana, pineapple, papaya, peach, and strawberry’ but, while not exactly inaccurate, I didn’t think it quite that complex. There was a faint custard taste at the outset and then a fruitier quality develops that is reminiscent of a cross between a golden delicious apple and a banana. There was no tartness at all (at least in the particular fruit we sampled) and I found the experience to be a bit like eating an avocado, but with a flavor much more appealing to my taste. I read that some people like eating the fruit after briefly freezing it (comparing the result to ice-cream) and I think I shall try this next time I buy the fruit. This little item actually sold for $4.99 each, but it was nice enough to pay the price again. I love custard apples. They are common in Australia. Normally not that many seeds though so the variants we get must be slightly different. Thanks for the shout out … and interesting point about vaccination. I never made the connection before but it makes sense: Cow pox: Cow = vaca in Spanish, Vache in French! Custard apples are one of my mom’s favourite fruits – I find all the pip a bit of a hassle but do enjoy the flavour of a custard apple. Hmm, never knew the inside of the pips were poisonous though! I’m so envious, I can’t get any cherimoyas down here right now. I love them, although they’re not easy to find. When I first tried one I wasn’t sure if I liked it right away, but after a few spoonfuls I really started to like the flavor a lot. And I love the consistency—it’s true, they really are good after freezing for a brief time. Enjoy! I’m going to try them frozen next time I see them. I can’t believe the wide varieties of products that are available at your coop…considering where you live. The exotic things tend to appear briefly and sometimes never again, but at least we get them from time to time. 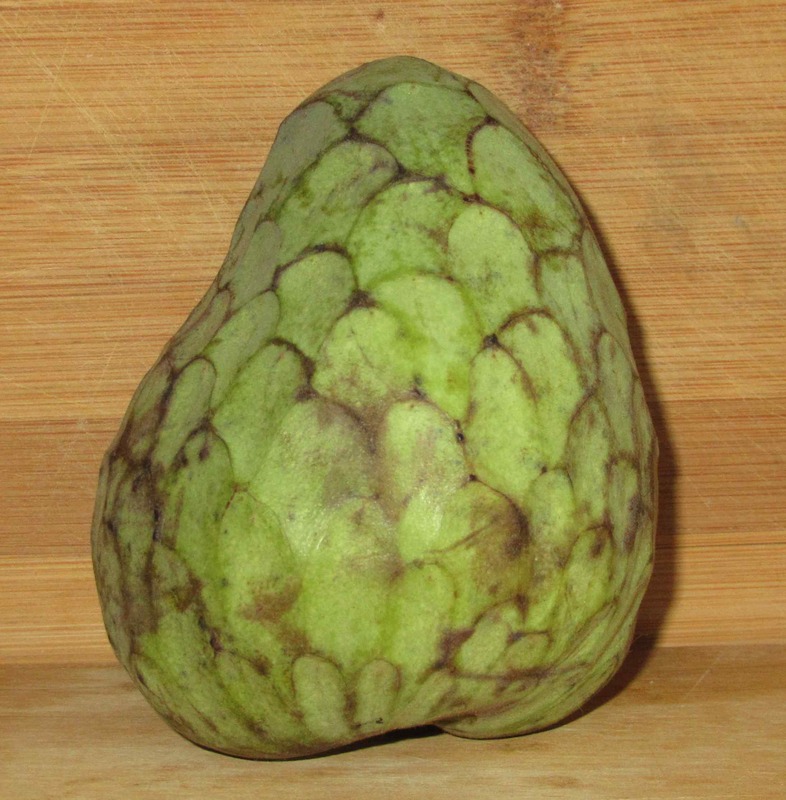 So THAT’S a cherimoya! I never knew what they were. 🙂 Looks good to me! I did not know that the inside seeds are poisonous. Thanks for the heads up on that as will have to be careful when consuming.